As we approached the Nairobi International Trade Fair showground from the Kibera gate, we had to go through several hawkers who sell their merchandise and services such as face painting for children and balloons which in their own thinking and estimation are a pre-requisite for the members of the public as they enter the Nairobi International Trade Fair show grounds. As a writer, I am always very keen to whatever is happening around me. This is because I have learnt that the devil is always in the details. 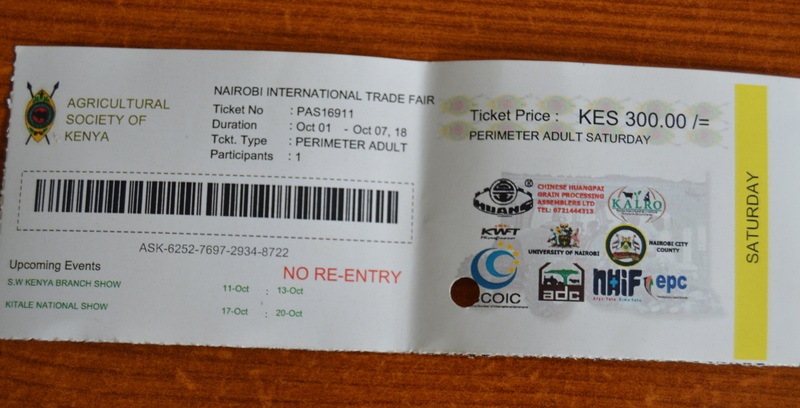 I scanned the place and was convinced that there was adequate security on the Nairobi International Trade Fair show grounds including outside the perimeter walls. Continuous surveillance was being undertaken to ensure no one sneaks through the fence. The police forces or service depending from which angle you look at it were all armed to the teeth. They were armed with guns, tear gas and batons ready to handle any security threat that may arise. We walked straight to the pigeon holes on the wall near the gate and purchased our tickets from the numerous clerks who were stationed there. These clerks were mostly ladies who wore Kenya Medical Training College or KMTC uniform. The show organizers must have sourced them from the state medical college in Nairobi. I paid cash and was presented with tickets. One for myself and the other for my entourage. A ticket prize for an adult was retailing at KES 300 while each child was required to pay KES. 250 each. I’ve never researched or tried to understand how much is generated by the tickets, stands and how is the revenues spend at the end of the day. How does the Agricultural Society of Kenya collect every year? 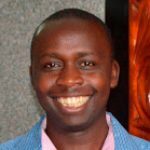 Is there a public access to the financial statements of the Agricultural Society of Kenya? Is this a function of counties or national government? What does the 4th Schedule of the Constitution of Kenya say about the trade fairs? This is a topic for another day. Ticket required to gain entry into the trade fair. 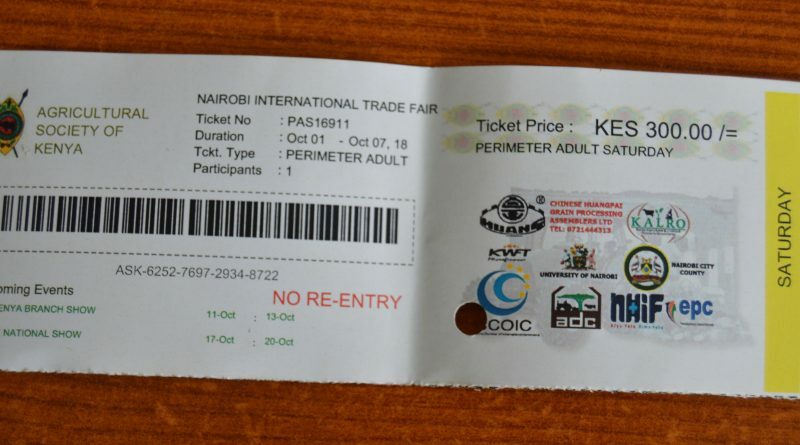 According to information published on the ticket, the organizers of the Nairobi International Trade Fair includes are: University of Nairobi (UON), National Hospital Insurance Fund (NHIF), Nairobi City County (NCC), Huang, ADC, KALRO, Chinese Huangpai Grain Processing Assemblers, Kenya Women Finance Trust, CCOIC and EPC. The ticket is issued for one entry. This means that there is no re-entry. If you get the ticket and gain your entry, then leave after a few minutes, you are required to pay again. That is what it means. The Nairobi International Trade Fair has been ongoing throughout the last one week. Today, Saturday 6 October 2018, I had a privilege to be part of the annual Nairobi International trade fair. There is not much difference since my first time at the show in 2014. At that time I mostly visited the business stands. In 2018 I made sure I went to sections of the trade fair that I’ve never visited before. That is how I believe I get value for my money. I decided to get to the ‘stadium’ where I discovered there was plenty of action going on. From church choirs, acting troupes to motorcycle races. We were particularly impressed by the skills of the motorcycle riders who ranged from youths aged 18+ years to some riders who looked more like 5 year olds. The size of their motorcycle varied according to their ages. As you know, you cannot tell the age of an individual through their physical appearance. Appearance is not reality. It was pure entertainment at this arena. The motorcycle racing particularly attracted large crowds from other sections of the Jamuhuri Show Grounds near Kibera Informal settlements. When I paid a visit to the livestock section, I felt short-changed. Maybe the serious farmers had left their stands. Next time, I will try to visit the show grounds on a week day and see if there is a difference. I’ve always observed that high school students end up spending most of their time at the entertainment joints at the show. They prefer watching the dancers of trucks with the DJs doing the mixing towards satisfaction of their clients. Further, I noted that the dancing and other related gimmicks are used to attract the crowds and then market or promote some specific products or services to the crowds who are mostly the youths. I’m not a feminist but my general observation shows that women are performing very well in terms of taking their children for outings to entertainment places such as the trade fairs among others. Thumbs up for all couples who take out the entire family to the entertainment joints out there. You are heroes. I know this heroic action price tag which is even harder during these hard economic times. As usual there were a few horses and camels which children and mostly women ride at a small fee.